Earlier in the season Bolton had produced a rousing come back to take a point from the encounter with Blackpool. This time out Ian Holloway narrowly got the better of Owen Coyle in a pulsating encounter. Ian Holloway set Blackpool up as he has for the last few games, with the flatter midfield three and brought in Jason Puncheon up front in place of Sergei Kornilenko. Owen Coyle brought Ricardo Gardner in to central midfield for the injured Johan Elmander. Coyle opted to set up in his usual 4-4-2 that saw his players sit narrow both on and off the ball, most noticeably Matthew Taylor sitting in narrow off the left flank and relatively high up the pitch. This seemed to be a ploy by Coyle to increase numerical superiority in attack to feed off their more direct approach. However, by lining up like this they conceded clear numerical advantage to Blackpool in the centre. Often in the first half David Vaughan found himself as the spare man in midfield. Holloway ensured that his players attacked from the beginning with his side swarming all over Bolton from the start. Blackpool’s numerical advantage in midfield counted for a lot in the first half as they dominated Bolton’s midfield two and Bolton as a result struggled to gain any kind of foothold in the game. Bolton’s best chances came from direct balls over the top of the midfield, from set pieces and more so from poor defensive positioning from the Blackpool back line. As an illustration of how Bolton struggled in the first half, their pass completion was a lowly 55%. They really struggled to get their wide men in to the game and really couldn’t sustain any periods of pressure. The dominance that Blackpool gained in the centre gave them excellent passing options and combined with the movement of their forwards, they played some excellent balls in to the channels and in behind Bolton to really test the mobility of their back line. Coyle addressed his midfield shortcomings by withdrawing Fabrice Muamba on 50 minutes and his replacement Tamir Cohen seemed to invigorate Bolton. Clearly after the break Coyle had asked his team to work harder from front to back to deny Blackpool as much time and space on the ball, and they were much better on it. Cohen himself expanding the play with a couple of quality passes and Bolton’s full backs were more assured on the ball and less wasteful. In the first half forward pressure on Paul Robinson forced him in to some poor passes and his pass completion was 50%, however, his better use of the ball in the second half meant that Bolton built their attacks more from the back and his pass completion went up to 77%. Considered passing from the back brought players like Chung-Yong Lee more in to the action and he had an impact. Overall Bolton’s pass completion went up to 66% and they had 71 more passes. At this stage, although Blackpool had the lead, Bolton were starting to move Blackpool around more, trying to drag them out of shape, but they also broke much better on the counter. It might be an obvious statement to make, but when the Blackpool forward line combines their movement, pace and finishing ability, Blackpool can score against any defence in this league. Games such as Wolves and Fulham away were characterised by static forward play and Blackpool failed to score. This match saw DJ Campbell drop deep, wide and in behind the Bolton defence to register two goals. The chalkboard below illustrates how he received the ball in the deep, before breaking in to the box to receive the ball where he’s at his most dangerous. Setting up plays in deep and breaking in to the box. 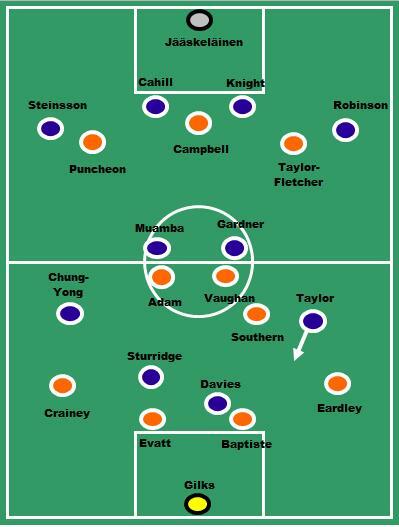 However, the roles of Jason Puncheon and Gary Taylor-Fletcher were crucial in the goals that Blackpool scored. Puncheon was composed on the ball, understood where he should be making his runs and combined well with the midfield to build some excellent attacks. Taylor-Fletcher, whilst not as efficient on the ball was incisive when needed to be and chipped in with two assists. His role is less about making the right runs, but more about the sleight of hand and the risk to make a pass. 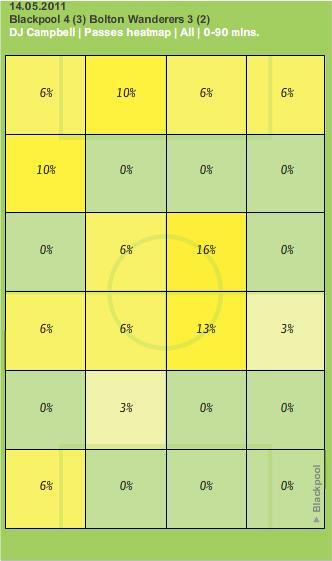 You can see his chalkboard below and notice how his unsuccessful passes tend to be around the box, but the key is that he is attempting those passes and only Charlie Adam has made more key passes per game than him this season. As highlighted in the preview the performance of Kevin Davies and Ian Evatt were central to this game. Davies struggled to link up play in the first half, but his ability in the air to win duels all game long was good, winning 10 of 17. In the second half, he played some excellent short passes and brought team mates in to the game and acted as a fulcrum for building counter attacks. On the other hand Ian Evatt continued his excellent recent form with a strong performance at the back. He won 7 of his 9 duels, even though at times the Blackpool back line lost their shape leaving their goal exposed. Therefore, whilst Evatt performed steadily all match long Davies was at the centre of the good things that Bolton did all match long, but grew in importance to Bolton as the match progressed and when he was withdrawn Bolton didn’t appear nearly as effective. For reference, they only managed two off target shots once he had departed on 83 minutes.